For Georgia homeowners, their family’s safety and well-being is at the top of their priority list. This can mean making tough decisions when it comes to your home, because some problems that affect your home and its foundation can be hazardous to your family’s health. In this instance, we’re talking about a dry crawlspace. A dry crawlspace is incredibly important for your family’s health. In many homes, moisture can leak in through cracks in the concrete. These cracks are often caused by foundation problems and can really hurt your family. Because of your crawlspace’s size, it is the perfect breeding ground for mold and mildew, both of which like damp, humid places. When moisture leaks into your crawlspace, it can become overrun with mold. Mold and mildew affect air quality, making it difficult to breath and increasing the likeliness of asthma and breathing problems in small children and the elderly. Unfortunately, the bad air quality doesn’t just affect the crawlspace. It will circulate throughout the house, harming everyone inside. This makes a dry crawlspace a key investment for your Georgia home. A dry crawlspace means that your family is not being subjected to hazardous mold and mildew, and the air they are breathing is as clean as it is supposed to be. A damp crawlspace may also affect the wood in your home, making it soft, pliable, and easily breakable, creating a falling hazard. Atlas Piers of Atlanta wants to ensure your family’s health and safety when it comes to a dry crawlspace. Once you have determined the need for repairs, you must consider your options. One option for crawlspace repairs is encapsulation. Encapsulation involves installing a vapor barrier in your crawlspace. Vapor barriers, usually made of plastic or foil sheets, can be installed in your crawlspace or basement. 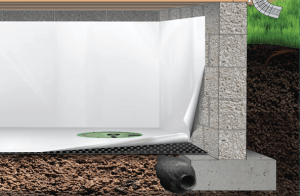 They create a water-tight seal designed to keep any moisture out of your home. Vapor barriers decrease the overall humidity in your home, lowering cooling bills in the summer. Different vapor barriers may provide different levels of effectiveness, so it is important to discuss your options with your contractor. The most durable and effective vapor barriers are made by Earth Contact Products, the company that supplies Atlas Piers. Encapsulation is best when done by professionals that know what they are doing. While it may be possible for you to install vapor barriers yourself, professionals are trained in installation and, in most cases, can apply a better seal to the area. Encapsulation is available for both basements and crawlspaces, ensuring the air in your home is less humid and more pure. Encapsulation can help prevent breathing problems in children, along with humidity damage such as sticking doors or windows and softened wood floors. If you must wait for an encapsulation specialist to arrive, you can ease the problem until it can be fixed professionally. One way to remedy the problem, at least for the time being, is to install a dehumidifier in the crawlspace. Simply remove as much moisture as possible, such as using a towel to soak up any pools of water, and place a humidifier in the room until Atlas Piers can survey the crawlspace. This may aid with any breathing problems your family might be experiencing. 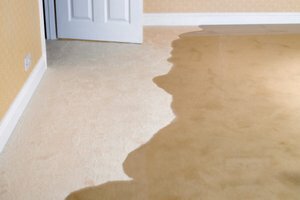 If you are planning on using a dehumidifier in your Georgia home, you must know that this will not solve the problem completely. Moisture will continue to find its way into the crawlspace until it is effectively waterproofed. Do not depend solely on a dehumidifier, especially if you are worried about your family’s health or have noticed problems in other parts of your home because of your wet crawlspace. 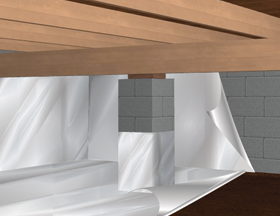 Crawlspace encapsulation is just one of the many services offered by Atlas Piers of Atlanta. Contact us today for a free estimate or more information.